• How can I build a business case for implementing archiving for E-Discovery? • How can I facilitate legal and investigatory workflow without IT dependencies? • How long should we save email? • How can archiving integrate with other discovery solutions? Everything you do is case driven, deadlines are everything and end user experience with data whether it’s uploading or analyzing is critical. All of these things mean the business value of data is in constant flux, but data storage treat all data equally forcing you to choose between staying in budget or meeting end user service level expectations. Join Chris McCall, SVP Marketing of NexGen Storage to discuss new value-driven data management capabilities designed to help Legal Service IT providers deliver a best-in-class end user experience. The dramatic shift towards mobile devices in the enterprise means that everyone today is in some form a mobile worker. Along with this comes the startling statistic that nearly 30% of enterprise data is being solely stored on these devices, decreasing visibility and increasing company data risks. When an impending litigation happens, will you know how to collect and preserve your mobile data? How will you manage this data through the handoff to processing and review without compromising data integrity? With eDiscovery costs continuing to rise, getting on top of your mobile data will be key to lowering expenses and keeping ahead of data risks. In a recent report, 39% of storage professionals said that data backup and recovery is a business challenge and 27% said it is a top IT priority. As the volume, variety, and velocity of data growth continues, legacy Backup, Recovery and Archiving (BURA) solutions are failing to keep pace. As the cost and complexity of protecting data continues to rise, more data is at risk. Join @HPStorage Guy Calvin Zito and a panel of experts as they discuss how BURA must be transformed to fit the New Style of IT. 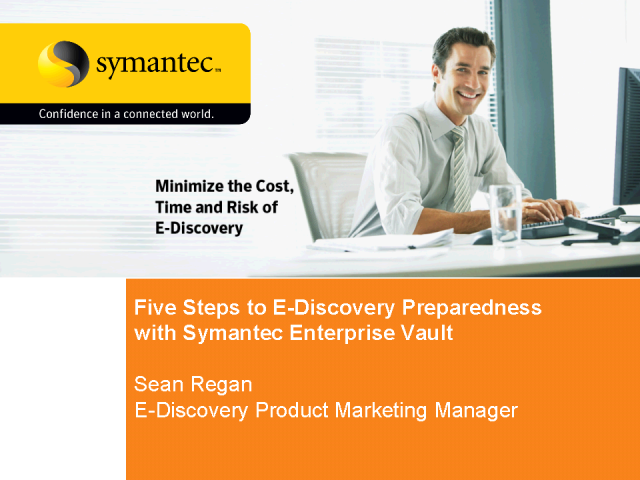 Join us to learn how Symantec can help with archiving and eDiscovery cloud initiatives. Depending on your strategic IT initiatives, Symantec can offer your organization either cloud based or on-premise solutions to meet your archiving and eDiscovery requirements. Learn about the options available to you from Amazon.com and Symantec to meet these important challenges with solutions from the #1 archiving and eDiscovery vendor. * What’s the ideal reporting structure? * Are CIOs an endangered species? * How is IT perceived by CXOs and the business units? * What and who drive technology innovation? * How do new technologies impact the evolving relationship? Register now – and bring questions for our panelists to address during the Q&A. With over 4 million users worldwide, Adobe EchoSign is the leading electronic signature provider, delivering efficiency and security to your the signing process for any document, contract or form. For operations such as finance, HR or legal, EchoSign enables streamlined operations, and for sales EchoSign offers accelerated revenue acquisition and improved customer satisfaction. See how EchoSign has transformed brand name companies from all industries - Aetna, Cigna, Facebook, Google, Time Warner Cable -- as well as thousands of small and medium businesses. You create it and store it. You manage it and retrieve it. You buy it and sell it. Information is the fuel that drives your business: it’s one of your greatest assets. But it can also be a liability. Having a records management solution in place, that spans electronic records and emails as well as physical records helps all organizations to not only reduce the risks they are exposed to, but to improve staff productivity while managing their records consistently and efficiently. Why does this matter? Well, not least because of the frequency with which poor information management and bad record-keeping practices are cited by regulators such as the FSA in the prosecution of their member firms. And not only that but the Information Commissioner now has the power to fine any business up to £500,000 in relation to poor information management practices – and the fines have already begun. Having a consistent, relevant and compliant records and information management infrastructure can not only mitigate these risks but also help improve process quality, increase efficiency and recognize significant cost savings at an operational level. But with real concerns on how to seamlessly (and consistently) integrate data from multiple sources and how to ensure that this data is integrated and embedded into business process, organizations are often confused as to how they can move towards an infrastructure-led approach to managing all corporate information. The target of discovery in civil litigation now is electronic data. The failure to respond effectively to electronic discovery demands can lead to significant monetary sanctions, adverse case results, and even jail time. The failure to have one’s electronic discovery house in order can mean that efforts to respond to electronic discovery demands can be extremely burdensome and expensive as repeat fire drills. This presentation will explain the current state of the law and technology when it comes to electronic discovery and will provide guidance on how best to effectively handle electronic discovery in civil litigation to minimize expense and to optimize case results. The use of social media evidence in electronic discovery has escalated dramatically in the last year. There are indeed “nuggets of gold” in social media evidence, but you don’t necessarily mine them without peril. There’s a way to do it correctly and a way to get yourself in trouble, perhaps by inadvertently doing something unethical or perhaps by simply not knowing how to obtain the evidence appropriately. Our experts will discuss the role of the Electronic Communications Privacy Act and the Stored Communications Act in dealing with social media evidence and they will also help you understand when to go to the social media provider and when to go to the user to procure your evidence. Case law is new in this area, but recent cases are instructive, and this session will discuss a few of the most noteworthy cases. A litigation hold is a process used by companies to advise their employees of pending or anticipated litigation and of their obligation to preserve relevant records . Recent case law and changes to Federal and State rules highlight the critical importance of these litigation holds. This webinar will focus on the design, implementation and maintenance of effective holds, all steps in avoiding evidence spoliation and foreclosing the possibility of punitive sanctions. •How to provide outside counsel secure access to the review data set in an easy-to-use, scalable, hosted review platform that supports multiple matters, multiple project teams and automated workflow to accelerate review. hiFred is Associate Director of Consulting for Iron Mountain Digital. In this capacity, he advises corporations and law firms on electronic discovery process creation, risk mitigation, and litigation and regulatory readiness related to information management and complex eDiscovery challenges. To prepare for litigation and regulatory needs, Fred works with clients to develop and implement programs designed to promote efficient, effective and defensible litigation response and eDiscovery best practices. Prior to joining Iron Mountain Digital, Fred was Senior Counsel for Repligen Corporation, a publicly-traded biopharmaceutical company, concentrating on the development of novel therapeutics for neurological disorders. As in-house counsel for Repligen, Fred handled several patent and commercial disputes of significant consequence for the Company. Most recently, Fred worked with and oversaw outside counsel on two large patent lawsuits that both resulted in highly successful settlements for Repligen. In the course of those and other litigations, Fred developed and managed all aspects of Repligen’s litigation readiness and eDiscovery program. The risks associated with spoliation of evidence are causing organizations everywhere to examine their procedures for evidence preservation. This seminar will offer step by step guidance for instituting and maintaining effective legal holds. Participants will gain a timely foundation for policy changes through the review of recent court decisions. Join this session to learn how one organization responded to an E-Discovery request in 20 minutes while dramatically reducing costs. Hear how a sound information management strategy can help organizations delete with confidence and discover efficiently. Topics covered include, backup, archiving, e-discovery, review and export. Storage Professionals today face the daunting task of being able to quickly know where every email, word document and database file lives and how to get it back in a hurry in the event of a catastrophe. With the update to the Federal Rules of Civil Procedure (FRCP) a storage professional now has even more pressure to potentially know the content inside those files. This session helps the storage professional understand the changes to the Federal Rules of Civil Procedure (FRCP). We will also look at an e-Discovery request from the perspective of a storage professional. Finally, we will provide some recommendations on how to prepare for an e-Discovery request. Without the right tools in place, collecting, processing, and reviewing electronic data for eDiscovery can be time-consuming, expensive, and expose a business to significant legal risks. With the introduction of basic email retention and discovery features in Exchange 2010, some organizations are delaying or canceling the deployment of third-party email archiving solutions. But can Exchange adequately address the need to preserve email evidence and deliver it under extremely tight deadlines? Attend this webinar to learn why third-party archiving solutions will continue to be necessary, despite eDiscovery capabilities in Exchange 2010. Almost four years after all electronic information became legally discoverable in US courts, organizations have moved to control the spiraling costs of processing legal data by bringing more of the e-discovery process in-house. This webinar will cover e-discovery software and services available to enterprise customers, user adoption and purchasing plans for 2010, and current and future market trends. Clive Freedman is a Barrister, Mediator and Arbitrator practising at 3 Verulam Buildings, Gray's Inn. His practice covers commercial disputes generally, including IT, construction, professional negligence, banking and commercial fraud. In recent years his main area of specialisation has been IT law, particularly contractual disputes arising from IT projects. He has also carried out a number of mediations of IT disputes for CEDR Solve. He is the co-author of Expert Determination (Sweet & Maxwell, 2008), and has contributed to Banking Litigation (Warne & Elliott, 1999 and 2005) and Bullen & Leake & Jacob's Precedents of Pleadings (chapter on IT Disputes). He is a Fellow of the British Computer Society and Chair of its Disciplinary Panel, and is a Fellow of the Chartered Institute of Arbitrators. He is a Trustee of the British and Irish Legal Information Institute (www.bailii.org - web site for accessing judgments of the Courts of the UK and Ireland).